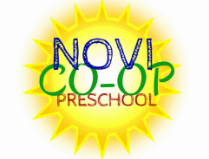 Novi Co-Op Preschool is a non-profit, non-denominational preschool owned and managed by parents. We do not discriminate on the basis of race, color, national or ethnic origin in administration of our educational policies, admission policies and other school-administered programs. We follow Novi Public Schools' calendar for our holidays and our inclement weather days. All adults working with the children in the classroom must pass a background check with the Michigan State Police & the Michigan Department of Social Services. Our teachers are CPR and first aid certified. They also are involved in professional organizations and participate in continuing education programs to ensure your children are receiving the very best education. We are a nut-free school.